So, today’s recipe isn’t exactly a dinner, but it is easy peasy! As I am still at my Mum’s I forgot to pre-upload the photos that I had planned for today, but this one was in my camera. Next week stay tuned for a winner of a vegetarian sausage roll recipe. I quickly whipped this up the other day when some friends were coming over around afternoon tea time. I had hardly anything in the cupboard as being without a car for the last few weeks (due to a certain incident) had meant few trips to the shops. What I love about this recipe is that I always, always have these ingredients in the cupboard and it only takes 20 mins. in the oven. I’ve been known to quickly put this together 5 minutes before impending arrival of guests on many an occasion. Place in a mixing bowl all dry ingredients. Melt together the butter and honey and pour into the dry ingredients. Mix thoroughly. Press into a greased, flat tray and bake in moderate oven for approx. 20 mins. Top with lemon icing if desired. You may or may not have read in this post, that my very clever sister Clare made a new header for me and a new button for easy peasy dinner winners every Tuesday. Please feel free to put this on your side bar or on your easy peasy post and link it back to here. Now it’s your turn, link in below with your easy dishes, dinners, desserts, snacks, whatever, but please remember to link back here so that others can join in too! * ‘Taste & See Anew’ – Bible Society of Australia. This recipe from B. Hall, Stawell Branch. Yum! 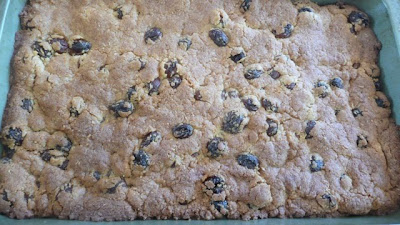 I love anything with raisins and coconut – to have them both in one thing is a dream come true! Love your new banner, looks fab! this looks yum &amp; um…….dead easy!! !